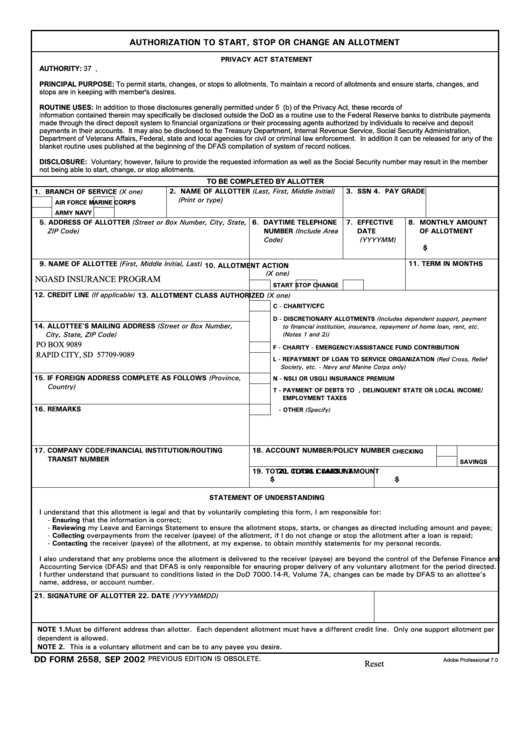 Download a blank fillable Dd Form 2558, Authorization To Start, Stop Or Change An Allotment in PDF format just by clicking the "DOWNLOAD PDF" button. Complete Dd Form 2558, Authorization To Start, Stop Or Change An Allotment with your personal data - all interactive fields are highlighted in places where you should type, access drop-down lists or select multiple-choice options. blanket routine uses published at the beginning of the DFAS compilation of system of record notices. not being able to start, change, or stop allotments.